Vincent P Geske was born on 3 April 1918 in Perth Amboy, New Jersey. He was inducted into the US Army on 29 December 1942 and trained as an adminstrative NCO. Then Sergeant Geske was assigned to the 747th Tank Battalion as a tank commander. The 747th Tank Battalion was an independent tank battalion that participated in the European Theater of Operations. It was credited with an assault landing at Omaha Beach, landing as part of the 1st Infantry Division the morning after the initial D-Day landings (D+1). 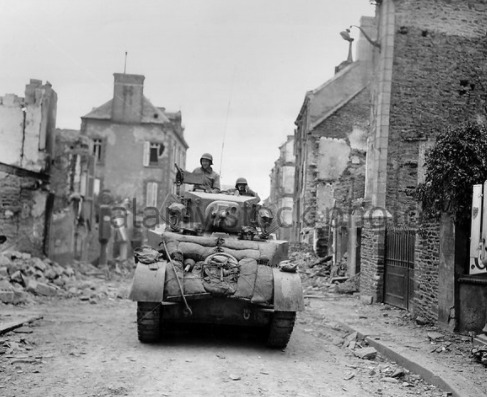 SGT Geske and his tank crew fought their way across France and into Germany while assigned at times to the 2nd Infantry Division, V Corps, 90th Infantry Division and the 29th Infantry Division. On 16 November, the 29th Infantry Division began its push toward the Roer River and Julich. SGT Geske's battalion supported all three infantry regiments of the 29th as they moved east along an axis from Merkstein to Siersdorf to Aldenhoven to Jülich. The advance was marked by sharp engagements in each hamlet and village along the route, with the infantry and tanks having to work closely together to overcome the German defenders dug into the basements and other strongpoints in each town. In addition, the tankers had to be vigilant at night to prevent German infiltrators from moving back into the captured towns during darkness. Now defending their homeland, German resistance was stiff, and it took the 29th Infantry Division a week to cover the ten miles to the western approaches to Jülich. The 747th suffered heavy losses as well, with 18 medium tanks lost to enemy action and 38 men either killed or wounded, and another 3 missing. It was on 21 November 1944 when SGT Geske was commanding a tank attacking enemy positions near Koslar, Germany. SGT Geske's tank was hit by enemy anti-tank fire and set on fire. SGT Geske dismounted and removed the wounded driver and carried him to a concealed position. Then, while still under intense enemy fire, he secured a door, improvised a litter and carried the wounded man to a place of safety. Immediately foolwing this aciton, SGT Geske ran to the flaming tank and evacuated the seriously wounded bow gunner. Displaying exceptional courage and initiative, SGT Geske again returned to the area and courageously directed tank fire upon the enemy weapons. For this gallantry in action, SGT Vincent Geske was awarded the nation's third highest award for valor, the Silver Star. In addition, for wounds received in this combat action, SGT Geske was awarded his second Purple Heart. First Sergeant Geske was demobilized on 13 November 1945. Sergeant Geske was to return to active duty and serve in the Korean War where he received a battlefield commission on 14 December 1950. 1LT Geske retired from the US Army at Redstone Arsenal, Alabama, in November 1967. He worked for the US Postal Service in Huntsville until his retirement in December 1987.